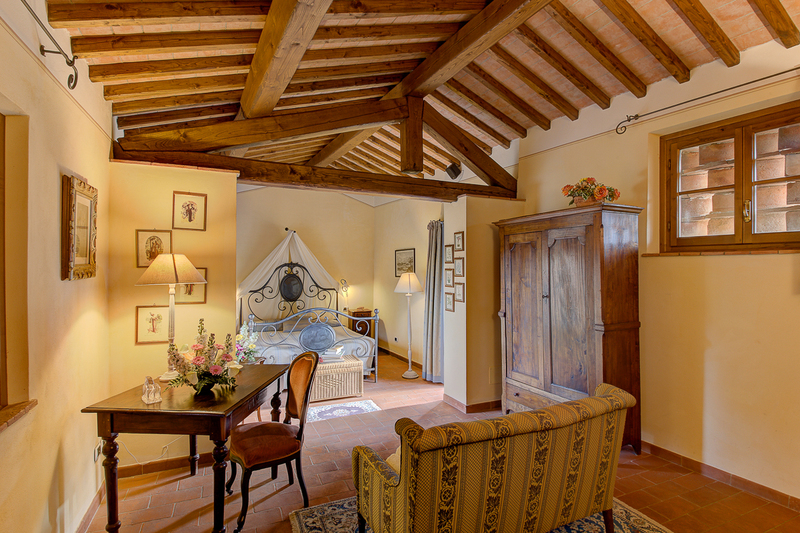 Antico Casale Sodini – Rent a Luxury Villa in Tuscany – Rent a Luxury Villa in Tuscany – Antico Casale Sodini – Live the Dream! Rent a Luxury Villa in Tuscany: In a small paradise near Lucca, in Tuscany, lies a very special villa, called “Villa Casale Sodini”. This charming luxury villa for rent, originally a mill and farmhouse, has been beautifully restored for rent. Our rental amenities are inclusive with no extra charges. This rental villa in Tuscany has no architectural pretences, is of simple lines, and built with the materials of the period: stones, hand-made bricks, timber beamed ceilings, and terracotta floors. As was customary, the ground floor of the villa was used to house animals and the farm workers slept upstairs. Thanks to the wide variety of photos of the villa (see gallery) one can get a good impression of this exclusive luxury villa for rent. The lush landscape of trees, bushes, and vines is typical of the Tuscan Lucchesian area. The beautiful swimming pool has amazing panoramic views of the green countryside with the Apennines Mountains in the distance. Villa Casale Sodini rental is in the heart of Tuscany near the medieval town of Lucca with the beautiful seaside not far away. This charming villa rental will allow you to experience a true Italy holiday while creating never to be forgotten memories. The province of Lucca offers great natural beauty, a mild climate and warm hospitality. We rent in the Tuscany area that is famous for delicious food, wine, and olive oil. Its central location allows the renter to explore the numerous sites of Tuscany such as Carrara, Chianti, Florence, Forte dei Marmi, Garfagnana, Lucca, Montecatini Terme, Pisa, Siena, Versilia, and Viareggio.